262 Broome Street immediately after the E.S.D.C gave a non-vote. Amazing how simple it was for them to acquire 2 buildings the way normal private businesses purchase property. They now own 3 buildings on the block. We are watching the Museum and will fight to the death to keep our building out of their hands. area, and Battery Park City. partnership with Ms. Abram and the museum on the many projects. protect the rights of tenants and landowners when they are threatened. involved in an issue that is clearly between two neighbors. East Side Tenement Museum and the Empire State Development Corporation (ESDC) to seize 99 Orchard Street through eminent domain in order to allow the museum to expand into this property. valuable cultural institutions. The museum provides a unique and important service to the city, as well as to the millions of tourists who pass through every year, educating us about the roots from which our city grew, and reminding us of the struggles and triumphs of our ancestors. I have long supported the museum, and will continue to do so. However, I cannot support this plan as it would result in tenant displacement and the loss of valuable housing stock. to support that expansion through any of a number of other means, I do not believe this expansion should result in the eviction of tenants from 99 Orchard Street. In light of the extreme shortage of housing stock which this city faces, I strongly insist that we not remove from the market needed housing units, even for the most worthy of causes such as the expansion of this venerable institution. expand this valuable cultural resource, and I am gratified to see that the ESDC is doing the same. But in this one instance, I must insist that the ESDC find another way to assist the museum, one which does not utilize eminent domain and which does not decrease the already chronically reduced housing stock in our city. RLC-NY DEFENDS RESIDENTS FROM TENEMENT MUSEUM LAND GRAB WHICH WOULD REPLACE REAL RESIDENTS WITH ACTORS PORTRAYING PAST TENANTS. GOVERNOR'S AID AND THAT OF CHALLENGERS SOUGHT IN DEFENSE. New York City 7/30/02: The Republican Liberty Caucus-NY (RLC-NY) calls on Gov. Pataki and his challengers to defend the residents of 99 Orchard Street in Manhattan from their neighbor, the Lower East Side Tenement Museum. 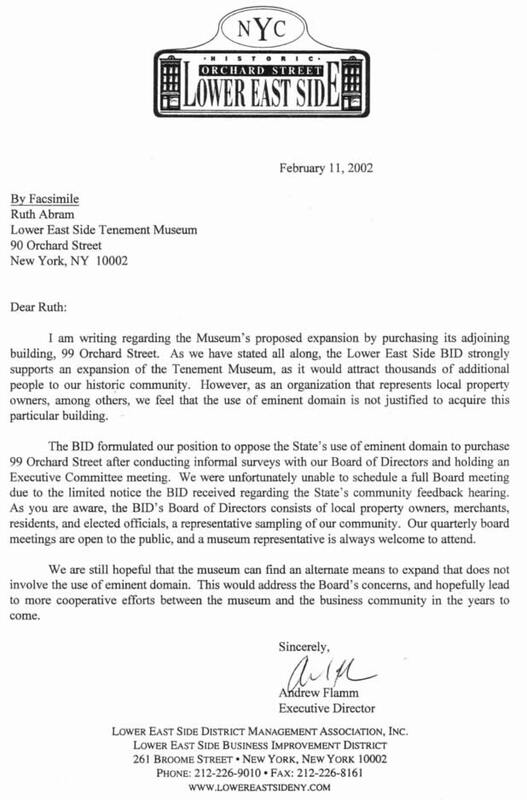 The Museum seeks to expand at the expense of Lou and Mimi Holtzman, co-owner Peter Liang and their tenants by having the Empire State Development Corporation, condemn the modernized building, which the museum will gut and turn into a tenement-style building. The Holtzman's live in the building, which has been in the Holtzman family for four generations. Cooper urges concerned Americans to speak out against the Museum's land grab by contacting Governor Pataki at Executive Chambers, Albany, NY 12224, (212) 681-4580, or gov.pataki@chamber.state.ny.us. 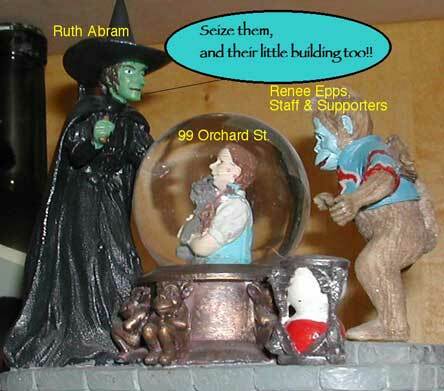 Republican Liberty Caucus-NY Director Richard Cooper contends, "The Lower East Side Tenement Museum's director Ruth Abram would force out the tenants of today living there, and have living history interpreters portray immigrant tenants of the past. All this paid for by New York's taxpayers, and to benefit a private organization at the expense of private landowners and their tenants. Libertarian Republicans call this legalized theft. The Republican Liberty Caucus-NY condemns this condemnation scheme's violation of property rights as unjust, outrageous, and comically absurd. The Governor and his challengers need to take a stand to stop a state agency from depriving owners of their property and residents of their homes. Eminent domain law must be changed to prevent transferring from one private owner to another." The Republican Liberty Caucus is a nationwide network for change by electing libertarian Republicans, according to Cooper, a former Libertarian Party of New York Chair. The meeting of Community Board 3 on 1/10/02 was successful. The board saw through her shallowness and voted a resounding NO. However, Ruth Abram went on a scathing attack of my character. She should be ashamed. She handed out a booklet full of half truths and lies. Thank you all. and stay updated. The Public Hearing on 1/9/02 was a success. The Lower East Side Business Association voted NO to the Eminent Domain attack from NYS. My neighbors really rallied for us.